Body and front frame: die-cast aluminium LM6, painted black RAL9005. Reflectors: dimpled anodized aluminium with specular side reflector. Lens: tempered 4mm flat glass with stainless steel bolts and silicone rubber gasket. Stirrup: 4mm mild steel, powder coated black, RAL 9005. Single gland cable entry suitable for Ø9-13mm OD cable with 3 pole terminal block for up to 4mm cables. Areapak 1 has a stirrup fixed by a single bolt through a 16mm diameter hole. Two additional 11mm diameter fixing holes at 102mm centres. AreaPak 2 has a stirrup fixed through a 21mm diameter hole. Two additional 13mm diameter fixing holes at 250mm centres. 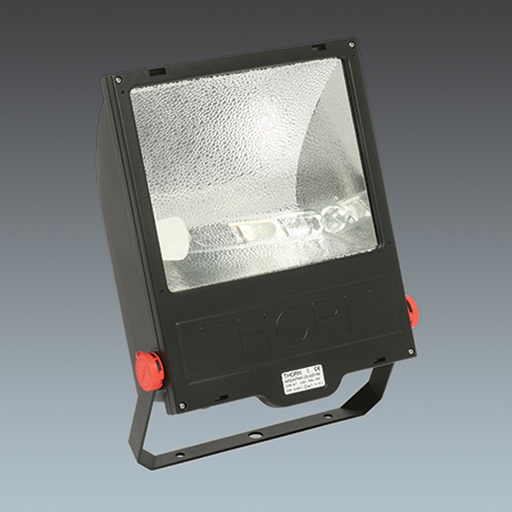 Enclosed floodlight with black aluminium LM6 body and frame, tempered flat glass, integral control gear and asymmetrical reflector suitable for 70/150 HST/HIT/HIT-DE or 250/400 HST/HIT lamp. Sealed to IP65. As Thorn Areapak 1 and 2.